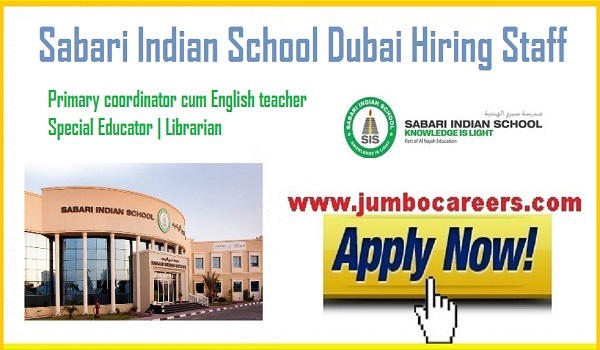 Leading Indian CBSE school in Dubai- Sabari Indian School Hiring Staff urgently. Benefits include 2 months annual leave with salary. About the Company : Sabari Indian School provide a secure, caring, inclusive and intellectually stimulating learning environment firmly founded on core values, trust and respect for each other. Students build positive attitudes towards learning through purposeful enquiry and hands on exploration. The school’s enriched CBSE curriculum bench marked against international standards offers a plethora of opportunities to every child to share, innovate and succeed. The trans formative and collaborative culture and ethos of school fosters independent, critical and creative thinkers and solutionaries with local and global perspectives.